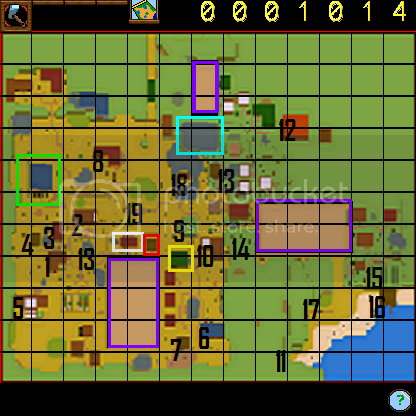 Purple : These are the 3 farming area; these are the only places in the game where you can farm. Unlike other farming games, everyone shares the same land, please note that your crops are you own, and no one can tamper with them, with the exception of watering them. This also applies as a general rule to everything you do in this game, with a few exceptions. Mine : This is where the mine is. Please note that mine is only accessible in the winter, and is located behind the water fall behind the fisherman house. Please be sure that you are out by spring 1st so that you don't get trapped inside and need to wait till next winter or re-log to get out. Sorry, ran out of colors, so I’m going to use numbers. 3: This is the Animal Tool Shop and the [u]charity[/u] ( see special tooling for more information for the animal tools, also see animals and shops and items. see shops and items for more information about the charity. 19: the Peddler's House. on every 3rd, 6th, 9th, and 12th of each season, he comes and brings one random item, a golden chicken statue, singing branch, trinity toy bag, power source, shipping crate, and very rarely, the lucky medal.